If there was ever such a thing as a low budget Mario and Sonic game then this is it. We no longer have the intense campaign mode from the first game and we don’t even get to keep the tournaments. With all of the characters and games already unlocked as well you just have to wonder what the developers were thinking. It’s not a bad game but it doesn’t do anything to help the Olympics legacy. It would have gone over better if this had been the first title in the series. We do have a new mode though and that is essentially Mario Party mode. Here you run around a board trying to get items and bump into one of the characters who is running around. This will trigger a mini game. You want to win the mini games to get cards that you can put in your sticker album. Once you’ve obtained 16 stickers (or more depending on the length you choose) you will have won the game. Inside your sticker board you have two random items as well which may steal stickers from other players or just give you extras. They’re pretty handy so use them wisely. If you want to blast through the party then simply seek out the NPCs as soon as possible. I’m not sure if there is even a point to delaying it to be honest since grabbing the items didn’t actually seem to be doing anything. There’s probably something that I’m missing though. I also have to point out that the mini games are starting to randomly get convoluted here. You should always be able to get a basic understanding of the game from the rules section before it starts. That wasn’t the case for the Dream Bike mini game. This one is a team game of 4 vs 4. You have to try and stay in a perfect line and shake your way to the goal. The problem is that you have to switch places during the race and the controls for being in the back were not clear. I struggled as best as I could but I just couldn’t form a line and I ended up losing the mini game and nearly the whole party map. I actually did lose the first time I played the mode, but I got them the second time. Even the really solid games suffer from dicey instructions. Take the Nintendo/Sega trivia. The questions were solid and with prep time I could probably even get them right. However the game tells you to hold the Wii Remote horizontally when in fact you are supposed to hold it vertically. This cost me the very first question which I knew I would have gotten right. So the main point here is to read the rules carefully and be warned that you may not be able to win some of these games on the first try because you will have to figure out how it works. One of the new games that is pretty solid is the throwing darts one. You essentially have to hit the bullseye as quickly as possible and try to get others. Essentially I don’t know if you go for all of the bullseyes but that would make sense. I hit 2 and won the mini game so just aim for the center and you will be all set. We’ve also got some games that I believe are old like Table Tennis and Soccer. Table Tennis is the same old same old so I wouldn’t expect too much more out of that one. It’s a fun game as always but it didn’t take much effort to port it over. I forgot if soccer already existed or not but it doesn’t look good for this game either way since the soccer gameplay is probably the weakest I’ve ever seen in the genre. I know low budget Wii games with better soccer gameplay. Your passes always go too high so it is usually safest to take the bell through the whole field yourself before shooting. That’s just not good gameplay and teamwork is supposed to be the name of the game here. I just don’t know how you can possibly mess up a game like soccer this way. 100mm Swinming is another mini game that doesn’t even try to hide how recycled it is. It’s the exact same controls as always in what appears to be the same background. It’s a good mini game so I’m fine with it coming back of course, but we just should have had more games. Reusing minigames is like bringing back old fighters in a classic fighting game. It’s a great move and one that I stand by 100%. However, if the cast is unchanged then there is no point in upgrading as in the case of Godzilla Save The Earth to Godzilla Unleashed on the PS2. What this Olympics should have done was have close to 40-50 events. They could easily have brought back events from the previous games in addition to a bunch of new ones. The only reason why I could see this being a bad thing is if they are trying to perfectly emulate the games that will be at each Olympics. If that is the case then I suppose they will need to find another solution (have the old mini games be unlockable) but either way we definitely needed more games than the rather limited amount that we got. The graphics look nice as always at least. It’s about the same as the last game only without the cinematic cutscenes so maybe it is actually a downgrade. Those cutscenes strike me as being the hard part after all but maybe the gameplay is just as difficult. Either way the last game did manage to do both so I’d give it the edge. When it comes to the soundtrack there is no contest that the last one was better. It blended together a bunch of brilliant themes from both Mario and Sonic which made the games even more fun. While this game has a lot of those songs in the music player, don’t expect to hear them very often. As far as the replay value goes I suppose that there is a lot to buy here. You can use your money to buy clothes which boost your stats and you can try to earn medals for all of the various mini games. That could take a little while and then you also have a lot of challenges to complete for the bragging rights. Complete all of the challenges and you will really be an Olympics champ. Considering that the game is pretty cheap I’d say that this is already enough value to justify the cost. Overall, This is one of those games that may have been more acceptable if it had been the first in the series. However it is the third and after seeing what this series could really do with the second game it feels like a total downgrade. The game just lost all of its heart and it felt like the developers just cashed it in this time. There wasn’t much effort put behind this game as far as I could see and even though this is a decent game I would recommend going back to buy the Winter Olympics instead. 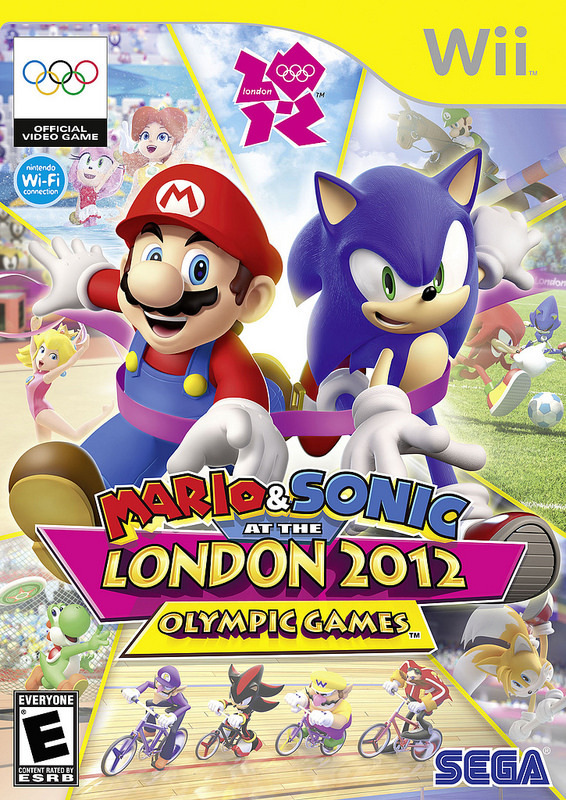 This entry was posted in 6 Star Games, Game Reviews, Games, Reviews and tagged Bowser, Crossover, Game Review, Knuckles, Luigi, Mario, Mario & Sonic at the London 2012 Olympic Games, Review, Sequel, Shadow, Sonic, Sonic The Hedgehog, Sport, Tails, Video Game Review by dreager1. Bookmark the permalink. I like having characters to unlock. It gives me something to strive for in a game.